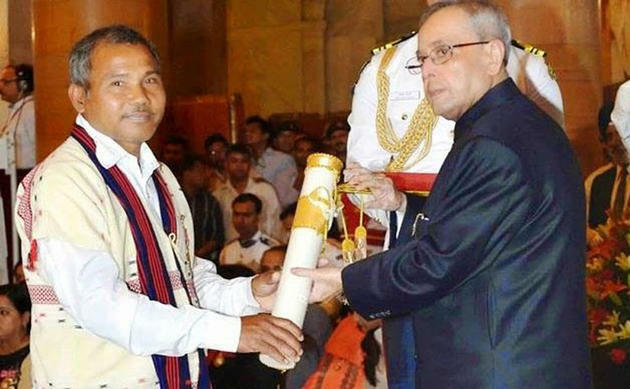 Since the 70's Jadav Payeng has been planting trees in order to save his island. To date, he has single-handedly planted a forest almost twice the size of Central Park, NYC. One thing that's true about India is that when it rains, it really does pour, especially when the Monsoon season comes around. In a matter of hours an entire river bed raises significantly and as a result, floods the surrounding area. Floods have a tendency of washing out all sorts of wildlife onto tree-less sandbars, where they end up dying due to excessive heat. An avid explorer since the early childhood, when he was just 16 years old, Jadav encountered a large number of dead snakes as he was exploring the area of one of the many sandbars on the glacier-fed river Brahmaputra. Jadav wanted to do something about this, so without hesitation he started off by planting around 20 bamboo seedlings on the sandbar. He didn't stop there. Over the course of several decades, he planted and tended trees on a sandbar, turning it into what is now considered a forest reserve. The forest, called Molai forest, after him, is located near Kokilamukh of Jorhat, Assam, India and encompasses an area of about 1,360 acres / 550 hectares. 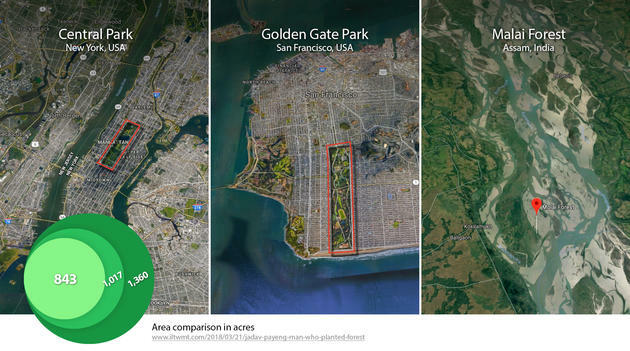 In comparison, the Central Park in New York is only 843 acres, and San Francisco's Golden Gate park is 1,017 acres. The forest now houses Bengal tigers, Indian rhinoceros, and over 100 deer and rabbits. Molai forest is also home to monkeys and several varieties of birds, including a large number of vultures. There are several thousand trees, including valcol, arjun (Terminalia arjuna), ejar (Lagerstroemia speciosa), goldmohur (Delonix regia), koroi (Albizia procera), moj (Archidendron bigeminum) and himolu (Bombax ceiba). Bamboo covers an area of over 300 hectares. In 2015, he was honored with Padma Shri, the fourth highest civilian award in India. 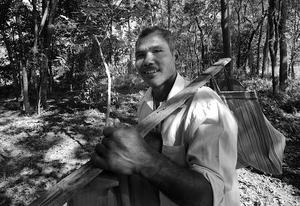 Jadav Payeng belongs to a tribe called "Mishing" in Assam, India. He lives in a small hut in the forest. Binita, his wife, and his 3 children (two sons and a daughter) accompany him. He has cattle and buffalo on his farm and sells the milk for his livelihood, which is his only source of income. Shavarsh Karapetyan is a retired Soviet-Armenian champion swimmer. He is an 11-time World Record holder, 17-time World Champion, 13-time European Champion and 7-time USSR Champion. 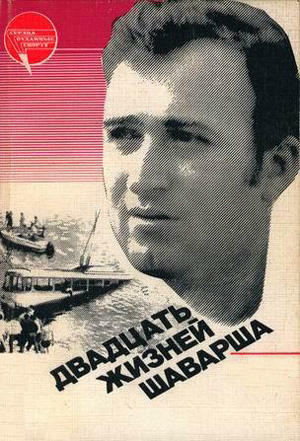 One cold morning on September 16th, 1976 he was doing his usual run along the dam in Erevan (Armenia), when a large trolleybus carrying 92 passengers lost control and flew off the road into the freezing water. During the impact, most of the passengers fell unconscious – the bus sank approximately 10 meters deep. Without a second of hesitation, Shavarsh leaped into the freezing water to rescue people.